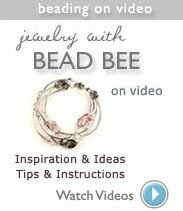 Bead Bee Beading Blog - project ideas, how to make jewelry, make your own jewelry ideas: Soft Flex or Flex-Rite? 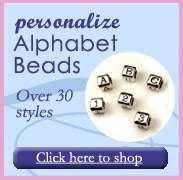 Bead Smith recently launched their own line of flexible beading wire. Many of us have been loyal to the same brand for years, however, when faced with so many options and brands, it may be difficult to know the difference. 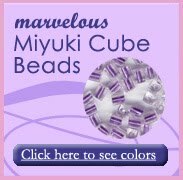 A bit of background for beginners who may be unfamiliar with flexible beading wire - it is basically stainless steel "mini" cable coated with nylon. There are many thicknesses and colors offered by several brands such as Soft Flex, Flex-Rite and Beadalon. The flexibility and strength increases with a higher strand count. Strand count ranges from 7-49 strands. After trying Bead Smith's new Flex-Rite product, it is now my stringing material of choice. The 49 strand Flex-Rite is a 24lb test strength (the comparable Soft Flex product has 26lb test strength) and is .018" thick, slightly thinner than Soft Flex which is .019". While this may seem to be a negligible difference, those who work a lot with gemstones and pearls, like me, will appreciate this .001" difference, which is often the difference between stringing your pearls or not, or doubling back when crimping. 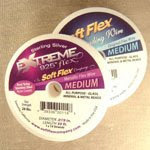 For sterling silver beading wire, I am loyal to the Soft Flex's Extreme 925 Flex (medium) which is the best value for its strength and flexibility. Which product do you prefer? Let us know! Sara from Soft Flex has provided me with this link so you can learn more about their products.